OBT principal dancer Artur Sultanov is a father! He and his wife, Cyndy, welcomed their new baby boy, Shane, into the world (and the OBT family) on July 15th! The OBT bloggers have been asked to keep the community updated on our summer musings, even if they have little to do with ballet. So, here's a picture keeping you updated on my summer status. In between teaching dance and visiting my family back in Nebraska, I've been working on my golf swing. I taught for two studios in the Omaha area owned by women that I formerly danced with. I taught Beginning and Intermediate/Advanced levels in ballet. Though I didn't dance much myself in Omaha, teaching was a nice way to still have a place to come a few times a week and stay connected to dance. And also to have an outlet, other than my living room, where I could point my feet and stretch myself and vaguely remember what it feels like to dance everyday. While I am trying to take advantage of the rest on vacation, I am eagerly anticipating our 20th anniversary season and returning to Portland. I've always wanted to partake of the Bastille Day festivities but somehow have missed out every summer-- until now! A small group of OBT dancers performed yesterday at Jameson Square as part of the Alliance Francais' annual Bastille Day celebration. We were in the lineup of day-long entertainment which included music, the famous waiters' race, and a mini "tour de France". Leta, Olga, and Brent performed a short minuet in the style of traditional French court dances, Steven and I did an excerpt from Christopher's ballet Zais, and Candace and Lucas danced a beautiful duet from a ballet by Paul Destrooper. I think the event was a big success. It was a gorgeous day to dance outside, we drew a large crowd, and I think we all had some fun as well. I wouldn't want to make a habit out of dancing on concrete, but we all survived! Singing the Marseillese--- David and Eileen Threefoot, Lucas' parents, were there to cheer us on and actually knew the words to the French national anthem! A big huge thanks to everyone who came out to support us! One interesting thing that summer brings for us dancers is the opportunity to perform outside of the normal OBT season. Sometimes this can be a tour arranged by OBT, sometimes it's a tour arranged by a fellow dancer, and sometimes it's a few of us who are wanting to get out in the community and just to dance raise awareness about our art form. Along with these other performances can come many interesting challenges, one of which is the physical floor we dance on. When we perform in the keller we have a nice sprung floor and marley to help us perform to the best of our ability. However, when performing in alternate venues we don't have the luxury of a sprung floor, and sometimes we don't even have a marley*. *Technical note: For those who don't know, a marley is a plasticy/rubbery sheet we put down where we're performing to keep us from slipping or sticking. It gives us a nice uniform floor to dance on. Anyway, I've had 3 experiences so far, and a 4th coming up tomorrow, of having to adapt to dancing on a different floor than we're used to. Second was that same day at Forkfly (www.forkfly.com). Forkfly was having a benefit for OBT at their headquarters and so Adrian, Gavin, Anne, and I offered our services to perform since they were being so kind in trying to raise some money for us. We danced two works by Anne, one is a new creation and the other is something she had previously created with a fellow OBT dancer. For this performance we did have a marley, but it was laid over carpet on a concrete floor, and it was a much smaller performing area than we were used to. We had to change spacing a little bit, but since only 2 people were dancing at a time it wasn't too terribly difficult. All in all, that performance was really enjoyable and seemed to be a big success. Third was a project for Anne's husband Lars. He wanted to create a looped film with some movement based around the idea of flight. He used an old 16mm camera (I think) and no lighting equipment or anything. We headed out to a park near their home in NE and while he set up Anne, Brian, and I created some basic movement phrases, with Lars' help, and then got to work. It was a really enjoyable afternoon. We did our phrases all sorts of different ways and then finished up with some partnering improv and solo improv stuff. However, moving around on grass and uneven ground can be quite tretcherous. Your feet stick a lot more than you expect them to, and sometimes you hit little divits you can't see. Irregardless, the weather was beautiful and it was a great time dancing outdoors. The performances tomorrow will be at 2:15 and 4:15. Stop by if you get a chance, it should be a really interesting event. We've just updated our Facebook page with photos from the Thank You Rally we held last Thursday. See if you can find yourself in them! 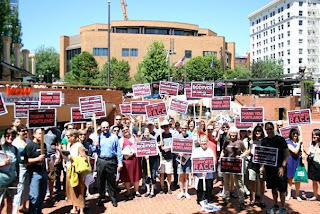 Thanks again to everyone who came to rally with us! And a big THANK YOU to everyone who continues to support the arts in Portland! As Steven mentioned yesterday, the staff and dancers are taking to the streets today to thank the Portland community for stepping up and supporting OBT in overwhelming numbers. We are so grateful! At noon, we'll be at Pioneer Square to show our gratitude for the community and our support of the arts in Portland. Meet us there! If you can't make this afternoon's rally, meet us at NW Glisan & 13th at 6:30pm for "Random Acts of Dance" as our beautiful dancers take to the streets with some creative and daring improv. We'll end at Forkfly HQ on NW 6th between Everett and Flanders for more improv and performances by Gavin Larsen & Adrian Fry and Anne Mueller & Steven Houser. The dancing is slated for 8pm, so don't be late! This event is a benefit for OBT, we hope you'll join us and show your support! Thank you Portland, for loving OBT as much as you do! Hi everyone! I know it's been a million years since I've written on here, and I promise a real post sometime soon, but I wanted to alert you all to some goings on tomorrow night for First Thursday. great. We'll be handing out fliers for a benefit being thrown for us later that evening. having a benefit for OBT at their headquarters (322 NW 6th Ave.). sounds like it going to be a very exciting and interesting event. I hope everyone is enjoying this amazing weather!